Calendars, Prints and original water colour paintings by Karen Ryder of classic cars in paddocks and sheds around Australia. Calendars, Prints and Paintings There is 1 product. 2018 Rustic Car Calendar A3 Size. Photos taken by Karen Ryder. Around Australia there are numerous motoring classics resting peacefully, or not so peacefully, in paddocks and sheds everywhere. 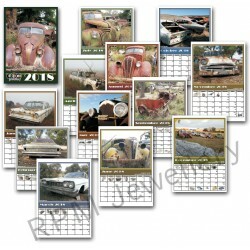 RPM Jewellery has produced a 2018 Rustic Car Calendar of old vehicles lazing around in the weather in Australia.